Once, when I was shopping at a perfume discounter, the owner brought me a fragrance and said: “You’ll like this. You’re a throwback.” I was taken aback. Was I? And was it so obvious? The suggested scent was a crisp green one, with the bite of galbanum, and I did like it, very much. I moved down the counter and snuffed the dusty tester, a bit embarrassed, while the owner helped a new customer pick out a bottle of Armani Code for women. Pickings for the bitter green fiend are rather slim at department stores at present. Counter sales assistants will tell you that such scents are now old-fashioned and do not sell well. I imagine those last crisp green floral buyers, stately and melancholy as they have always been, at home with their Lauren Hutton cheekbones and maybe the accouterments of WASP style mentioned in Angela’s Estée Lauder Private Collection review: boat sneakers, gin martinis in iced silver carafes and small, strangely dignified dogs. (Of course, I still buy these perfumes and I am short, roundish and never to be found in tennis whites, alas. I would like a schnauzer, though.) Shopping at the mall these days, one worries that such green fragrances will go extinct, like the serious hats men used to wear in Cheever short stories. As with many holes in the market bemoaned by the fragrance obsessed, however, indie perfumers have leaped in to fill the galbanum gap. Galbanum is an aromatic gum resin that solidifies after seeping out of large fennel-like flowering plants, from the genus Ferula, which are plentiful in the mountains of Iran. One of oldest perfume and incense ingredients, galbanum resin is famed for the complexity and pungency of its odor, variously described as bitter, musky, cool, spicy, woody, earthy, sweet, waxy, chalky, dry and pine-like... as well as just intensely green. In a blog post on the ingredient, indie perfumer and visual artist Bruno Fazzolari calls the essential oil “harsh and unpleasant, like acrid, chopped spinach”. Certainly, galbanum contains terpenes and those who dislike the smell often find it too sharp and turpentine-like up top. Others compare the initial blast to cut green peppers or hyacinth leaves. Used as an accent note in perfumery, though, much the way that closely related asafoetida resin is used in cuisine, galbanum highlights many diverse facets of floral, chypre, oriental and woody scents over the course of their development. Fazzolari categorizes it as among the chameleon perfume materials, those that "change with their context". Describing the green scent family, fragrance taxonomist Michael Edwards has commented on the turn away from galbanum in mainstream perfumes in recent years, and the turn towards a palette of lighter, softer, fresher blended green notes that better suit contemporary tastes. But indie perfumers seem to be sponsoring a galbanum revival, if the five scents below are any indication. Bruno Fazzolari Au Delà Narcisse des Montagnes: As I have not so subtly foreshadowed, Bruno Fazzolari is one of the independent noses finding uses for galbanum in his vintage-inspired creations. In this limited edition of his original Au Delà, the note adds a powdery silkiness to the white floral and amber core of the perfume. The tang of the opening galbanum and bergamot also seems to play up the saltier side of the oakmoss, which cleverly balances the richness of the rest. No version of Au Delà is currently available for sale, but hopefully Fazzolari will be offering this wonderful work of retro glamour seasonally. Anatole Lebreton L'Eau de Merzhin: Similarly salty, this is a fresh, en plein air tribute to the perfumer's native moor and marshlands of Brittany. L'Eau de Merzhin starts with a big, breezy blast of galbanum, familiar from classics like Balmain Vent Vert and Estée Lauder Aliage, and then settles into a duet between sweet, dusty notes of hay and vanilla grass and woody, bitter, celery-like greens. Very natural and very nice. Zoologist Perfumes Macaque: When this one launched, brand founder and editor, Victor Wong, interviewed indie perfumer Sarah McCartney, of 4160 Tuesdays, on how she went about composing an olfactory likeness of the Japanese macaque. After including fruit, musk, wood and incense notes to invoke food offerings at an Eastern temple, McCartney decided on galbanum to color in the surrounding foliage. "I remember John Stephen saying that he thinks galbanum is sadly underused in modern perfumery," McCartney commented, "and when I was on one of Karen Gilbert's courses in 2011 she recommend galbanum as a material which always seems to answer the question, "What's missing?"" The result is a deeply meditative fragrance, in shades of cool green, gray and tan. I think it is a perfect saru portrait, poised somewhere between the smells of fur, incense ash and a weathered cedar bench. Vero Profumo Mito: The Eau de Parfum concentration of Mito was one of my favorite fragrances of 2012 and I'm still raving about it. A bittersweet, crisp, glossy Iranian galbanum note, off-set by citrus, moss and waxy floral tones, Mito makes a beautiful promise of blue skies and cool shade. Baruti Tindrer: The clearest scent on this list, Tindrer is a very dewy green violet. Galbanum often has a slightly sober cast, but here perfumer Spyros Drosopoulos gives it a carefree character. This is a good choice for a day when you need to wear an aura, rather than a perfume, somewhat in the vein of the CB I Hate Perfume line. Note: top image is NZ Fern. 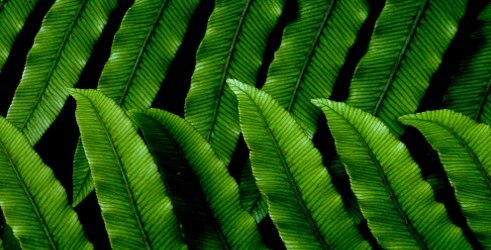 (Blechnum chambersii) [cropped] by Bernard Spragg. NZ at flickr; public domain. Great post, thanks. I love galbanum in No 19/ Heure Exquise/ Silences etc but never came across new niche scents with it. One problem is that several of these indie scents cost a lot more than Silences would now — economies of scale. But if you’re looking to sample one from the list, I think you would enjoy Mito, based on your other mentioned loves. Actually, I’m being thick, I have tried Mito in Bloom’s. Seem to remember I loved the start and then the overripe fruit note got a bit much (may have been the Voile d’Extrait I actually tried on skin). Must admit I didn’t try too hard to acquire the taste given the bank balance implications! I did not like the Voile d’Extrait of Mito nearly as much as the EdP — too much tuberose and peach to suit the theme for me. But yes, better not to fall in love with something so account-imperiling. I equate galbanum with bitter green. My go to galbanum fragrances are No. 19 EDP (probably my most worn fragrance) and Heure Exquise (should wear this more often). Out the Vero Profumo line, the only one I “got” was Mito; sadly, I don’t yet have a bottle…will need to revisit before I do so. When I was at Fumerie in Portland over the summer, out of the 50+ perfumes I smelled (yeah, there were 3 of us including AnnE and ede97005 and we stunk up the place), Au Dela was one of the finalist FBW but it turned plasticky on me so I held back and now it is temporarily not available. I’m a huge Chanel 19 edp fan too! Lately, every time I see someone talking about it and Huere Exquise together, I realize that I really need to try HE. How do they compare? And which iteration of 19 edp do you wear? Current? Vintage? A few years old? Chanel 19 has changed sooo many times. I remember there being a fair amount of hyacinth in Heure Exquise and the dry down in No. 19 has more leather, less powder. They’re definitely similar in spirit, though. But it’s been a while since I wore the Goutal. Heure Exquise has a sandalwood base. There is a nice post at Perfume posse where the two are compared if I remember well. Apologies it is on Mals’s blog! Highly recommend reading. The Goutal is a beauty. I had a large decant of Mito, but I seem to have somehow worked my way through it, so I think a (pricey) bottle may one day be in order for me. I do remember the first time I tried No. 19 parfum and it was a revelation: a big golden light poured down and I thought to myself: “Oh. So *that* is perfume.” Oddly, though, I don’t own a full bottle or wear it often. Somehow, I ended up with Cristalle EdT as my Chanel galbanum fix. Plasticky, eh? Could it be a facet of the amber, I wonder? Besides salt, I occasionally get a sort of umami smell from the middle moments. I feel slightly crazy, but it almost smells like mushrooms to me. I was just craving Mito somethin’ crazy last night! I really want to do a ‘ treat yo’self ‘. lol Perhaps for Christmas? But then that means I have to wait for that juicy, verdant green scent! I love how it is such a mood changer for me. Mito helps me feel polished, clean, while also giving me the sensation of spring beauty, with wet green gardens, bright sun and cool blue skies. Gah! I loved and went through my decant quickly a long time ago. Haven’t smelled the others on this list but always enjoy yer posts. Hugs! Always nice to “hear” from you, here and there. I know exactly what you mean — but it’s a big treat. (And one I’m pondering myself.) Still, you deserve a beautiful mood changer. You can count on me to be Ms. L’Oreal over here: Because you’re worth it! Flower Market by Lush featured carnation, galbanum, violet leaf, and elemi. Fiery, green goodness. Thanks for mentioning that one: I wish I hadn’t missed it, it always sounds great. My ears prick up when I hear elemi in a note list, too. I do really like Lush Flowers Barrow, but the green there was geranium, which I sense is another ingredient that is falling out of fashion. You fear geranium might be going out of style? What a shame! I just discovered how much I love it in perfumery. I’d love to see a list of geranium favorites from you! Thanks for the suggestion! I hope I’m wrong. Maybe that will be my next NST post — love to research the notes. I adore galbanum, but it’s difficult for so many people that I’m not surprised it’s fallen out of fashion in these days of smelling like candy and/or laundry. DSH Perfumes’ Garden at Giverny has a gorgeous inky- green galbanum that I just love. DSH seems to have a few galbanum options that have had rave reviews, but I haven’t managed to smell any of them. (It’s a terrible cliché about her line, but I can’t keep up with her output.) It’s interesting that several of the listed perfumes as well as your suggestion are outdoorsy, garden/nature tribute scents. Perhaps the more formal, retro green floral in the Fazzolari mode (or like No. 19, say) really is on the way out. What a great post. I love galbanum and the retro green florals, I love and own both 19 and Heure Exquise in all forms. I do love Cristalle as well. My sister used to wear Yohji, very sadly discontinued, I think galbanum love runs in the family. Retro greens are always right on my skin, they never tire me out. I hope there will be a natural retro green movement again after the current sugar crush. I never got to try the feminine Yohji, although I remember somebody in the know telling me I’d love it. And yes, I wonder if, in conjunction with the political turn of events in the US, we’ll have an early 70s revival movement. In perfume, if perhaps nowhere else, that will be a welcome turn of events: No. 19, Cristalle, Private Collection, Aliage, Rive Gauche, etc., all born in those years. Love galbanum! I can’t recall if it has galbanum, but the greenest thing I’ve ever smelled would have to be Corsica Furiosa. I recommend it to anyone wanting green without compromise. I believe a lot of the bite in CF comes from tomato leaf. But it definitely is a big whoosh of green. Marc-Antoine Corticchiato seems to like galbanum and green notes in general. Have you tried his La Parfumerie Moderne No Sport? Angela has a review of it here, I think. I prefer Années Folles, but it’s an interesting line in general. Love galbanum and will try these when I have a chance. Very disappointed with my bottle of current Vent Vert. No galbanum at all in there, it smells artificial, lacks complexity – heck, it smells like some sort of cleansing product and pierces my poor old nose. What about those green TFs, have you tried/liked any? Yes, blast, it’s too bad they’ve ruined Vent Vert. Ivoire was another greenish Balmain that they’ve done a number on. Those new green Fords have been stalking me — Vert des Bois keeps showing up in my fragrance emails and side-bar ads — but no, I haven’t tried any of the four yet. I need to get on that. I tend to forget about TF because there are so many of them, and most aren’t my style, but then I miss getting a bottle of the Shanghai Lily and Fleur de Chine types. I grew up in the era of chewy green chypres of the 60s and 70s and loved them. Thanks for these recommendations and the information on garbanzo! Chewy is a great word for them! Base: patchouli, vetiver, oakmoss, salt, incense, atlas cedar and amber. Ha, funny, I did almost order a BeauFort Fathom sample the other day, love the name and imagery. And the Boszporusz does sound up my alley. Nishane Sultan Vetiver was one of my finds of the summer, and that one has a bit of bitter-green freshness to it, too. Another niche with galbanum I forgot (and actually own) is Lune de Givre by Cloon Keen Atelier. It’s galbanum and iris but very very different to No 19 etc – hefty dose of angelica and ambrette I think. Hadn’t heard of that one, sounds intriguing. From the note list and reviews, it appears to have some similarities to L’Eau de Merzhin, which you might appreciate. Great post, Erin! Several of these are calling to me. My main galbanum fix comes from my vintage Vol de Nuit extrait. Several years ago now, I collected (i.e. hoarded ) several small bottles and am I glad I did! Thanks! Oh, you clever monkey, as my mom would say. One of my best local perfume buddies also hoarded a few vintage Vol de Nuit parfum sources a few years ago and he is very pleased with himself now. You both smell beautiful. Not a long weekend for me, as we give thanks for the harvest a lot earlier in Canada, but have a very happy holiday, R.
Not a big green fan, but I do have Au Delà and Vol de Nuit. And Chamade too, although that may be narcissus and not galbanum. My favourite green scent (and it is a beautiful shade of green) is Etro Palais Jamais. Oh, Chamade is definitely a galbanum scent, as most fragrances also with hyacinth are. One of my favorite greens, it is. Do you have the vintage, emerald-colored Palais Jamais juice? I have a newish PJ bottle, post-reformulation and the liquid is chartreuse . I understood the vintage stuff was less floral, more vetiver-ish and mossy, the sounds of which appealed to me. Yes, my bottle is vintage and emerald green. It isn’t flowery at all, and has a smoky tea note I love. My all-time favourite green was AG’s much missed Eau de Camille, & people who know me from commenting here will be aware of my devotion to Penhaligon’s Bluebell, though I don’t suppose they can be considered niche these days. I’m visiting London soon so if I get to Les Senteurs I may try the Cloon Keen one mentioned above. When I first started getting interested in perfume, I lived near a Goutal counter and all the hype then seemed to be about Eau de Charlotte, which was, at the time, very black-curranty and on-point with the floral gourmand trend of Angel, etc.. I don’t remember Eau de Camille well, but have a feeling I’d prefer it now. Have fun on your trip!